I was really sad when I found out there were only a couple Moni/Cebola pics here, for some reason I thought there would be more? 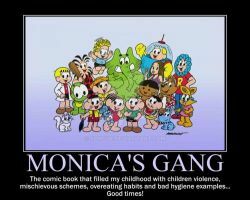 Turma da Monica ("Monicas gang" in English) is a REALLY FAMOUS (I-In Brasil lol) Brasilian comic (Well, it has animations too but primarily is a comic). The 4 MAIN main charas are Monica, Cebolinha (the 2 in the pic), Magali and Cascao. I grew up with these characters haha - My first "style" was an attempt copy of Mauricio de Sousa's XDD (The creator or TDM). I've wanted to draw proper fa for aaaaaaaages!! Sorry for the unactiveness!!! Like not commenting on stuff, late replys, no uploads lol etc etc ><;;;; Probably wont have anything else until next weekend, sorry!! I was really suprised at how many people who read 123s is from Brasil ouo!!! It's only like 3 people lol BUT STILL!!! HRM, I THINK THAT'S ALL. Gostei, ficou simples mas bem chamativo ! Muito fofo mesmo,que programa vc usou? é verdade que não tem turma da mônica em mangá aí nos USA? Ta muito lindo. Da até pra ver a historinha, todas as amiguinhas da monica tem namorado, e como ela se sente de lado, e o Luca nao deu certo, pq nao o Cê? AHHHH RIGHT, your prom your prom! It's over now right @@ I think I saw some pictures of it on facebook. Haha though I oughta read more! That one has been my favorite among most comics I read and onion does come from latin language...! *didn't know* And in french it's oignon @u@! Cebolinha sounds like "cebolla" (onion in spanish xD ). Ahaha, eu tambem~~ X''> <333 Muito obrigada!! Cool!! And Now they Grew Up! !